The deck is all sealed up, sort of! It has been a busy 2 weeks under the shed. As the weather warms up, so does the heat inside the shed. More and more holes are being cut in the shed to let some air circulate. We get most of our weekend work done by noon because it is really unbearable to stay in the “greenhouse” with the noontime sun shining down. I am still not sure how Brian does it everyday, but he tolerates the temperature changes so much better than I do. 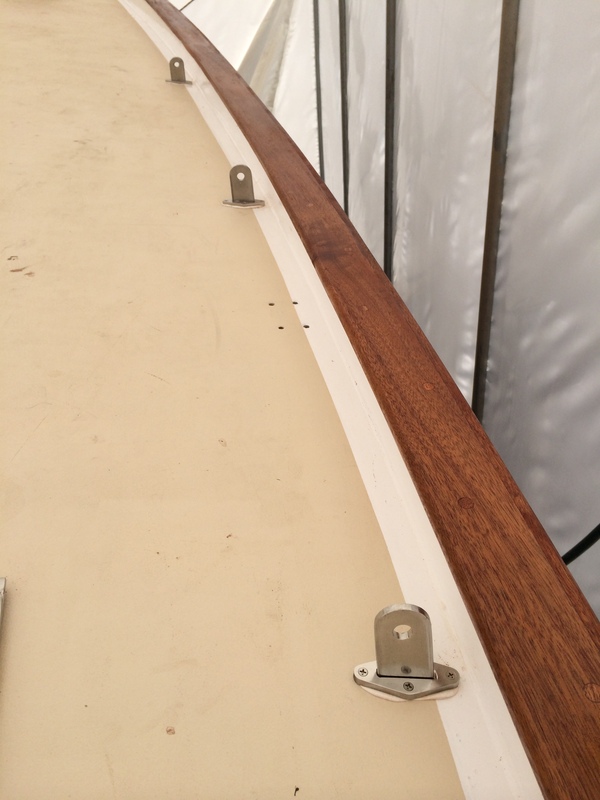 Last weekend we completed the deck hardware installation. All chainplates and covers are now in place, the bow pulpit is wired for lights and installed, the stern rail is all set as well. 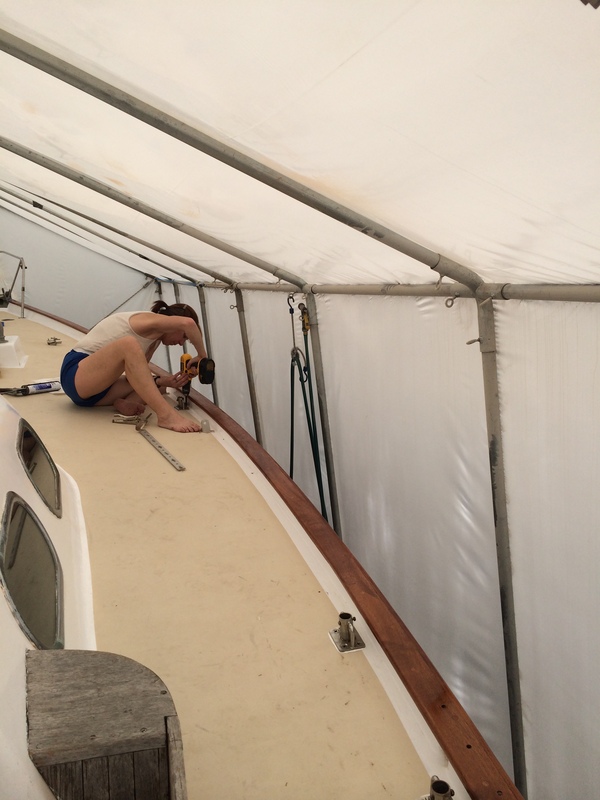 I worked on the deck stansions as well last weekend, always fun to play with the caulking gun. So at this point, every open hole is filled or reused. 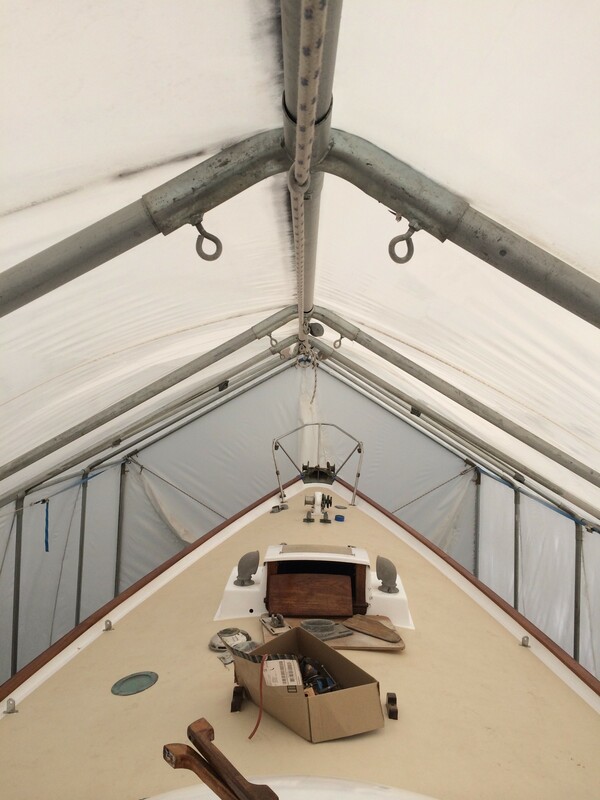 This is really important because the deck has been protected and dry for 8 months now, the last thing we want to do is cut open the shed, have it rain on the boat and saturate the balsa wood under the deck! 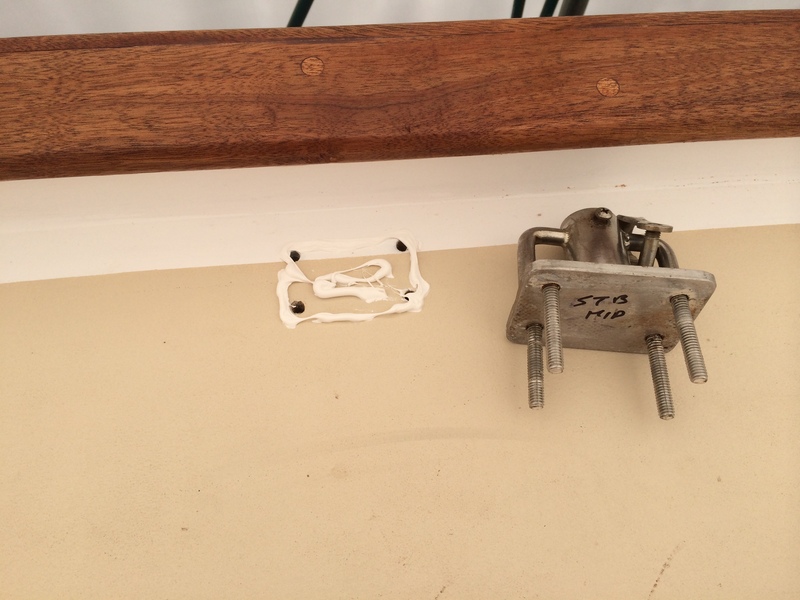 While I was playing with caulk, Brian was wiring the V-berth and the port side lights. 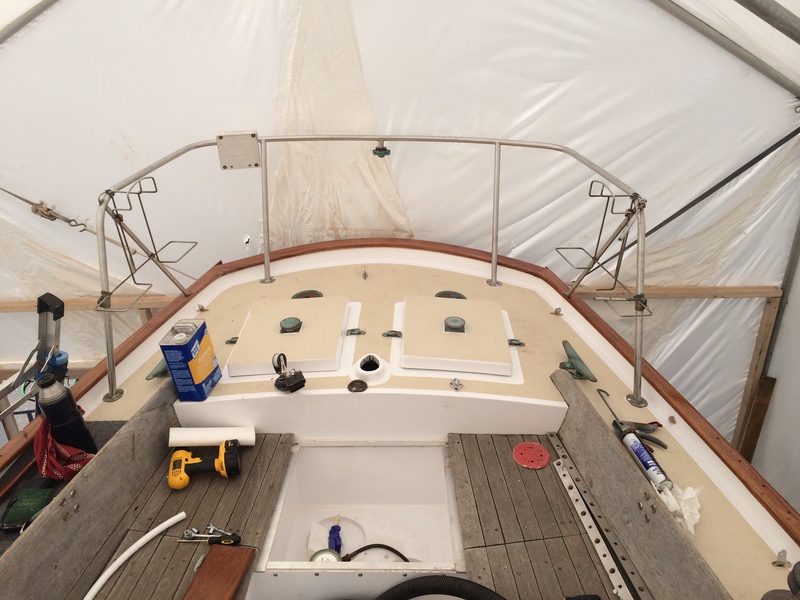 This all needs to be done before he completes the head, dinette, reefer box and galley because the wires and water hoses will all run along the inside of the hull behind all of the woodwork he is doing. The last piece of the stern toerail was finally put in place as well. That may have been the most time consuming, expensive project we have done, but it is a work of art. 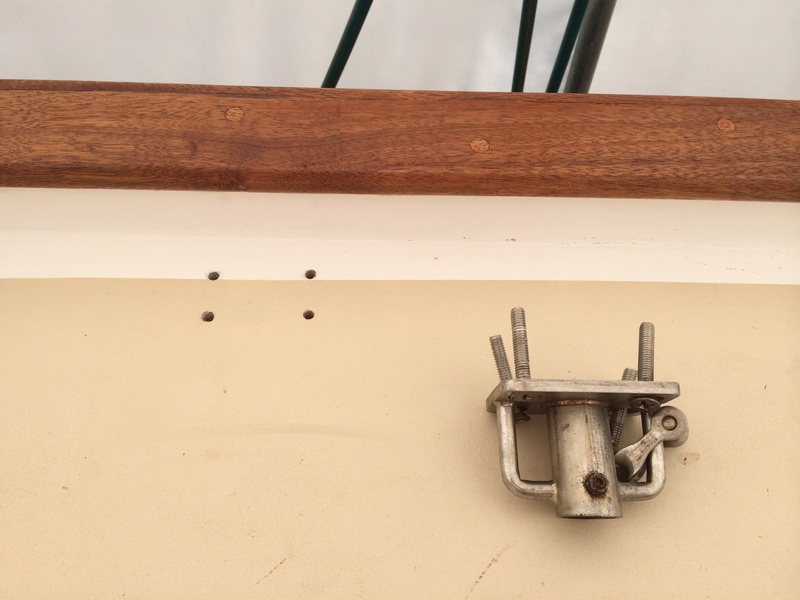 Someone asked me what the toerail actually was, and here is my amature answer – the toerail protects the edge of the boat where the deck meets the hull. It saves the edge when a boat comes aside, it keeps the water from leaking in, it looks damn good on a classic boat, and best yet, there is nothing like a sail on “Scout” with the rail in the water. That is how “Scout” sails best, big wind and big chop! Brian also reinstalled the genoa tracks on the new toerail, that was a nightmare for him, but it is done!